In "The J Curve", political risk consultant Ian Bremmer discusses the upheaval that occurs as countries lurch toward or regress away from democratization. His thesis is that states can be plotted along a vertical axis of stability and a horizontal axis of openness, and a curve resembling the letter J will result. In other words, in the short term, democratization requires risking stability for openness before countries can reach an equilibrium where both principles not only co-exist but are mutually reinforcing, and as Bremmer details, some countries are better at negotiating the impasse than others. Examples he uses to illustrate the far left side of the curve are places like North Korea and Cuba (which are relatively stable yet extremely closed), in contrast with other experiences like those in Iran, Saudi Arabia and Russia which exhibit slightly more liberal traits but are still negotiating the way forward as they slide down the curve towards instability at present. 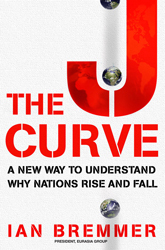 Then, in a chapter titled "The Depths of the J Curve", he compares South Africa's shift away from apartheid with the chaos of the former Yugoslavia after the fall of Communism, and then looks at countries which have faced numerous obstacles over their history but for all intents and purposes are on the right side of the curve - Turkey, Israel and India. Finally, he examines China's chances of shifting from the left side to the right side while avoiding the bottom end of the curve altogether. This is a readable and general yet thoroughly researched and eye-opening explanation of how states develop. Rather than just taking a simple theory and making a book out of what would otherwise suffice as a journal article in Foreign Affairs or what have you, Bremmer also makes some excellent arguments about other issues in global affairs such as the ineffectiveness of sanctions, economic "shock therapy" as practiced in the post-Soviet republics and South America, and the impact of personality, among other things, to compliment the observations he makes about the forward path towards political modernization. I would strongly recommend picking this one up. It's an excellent 250-page primer on the many changes going on in the world today and it provides a clear lens through which to see the future.